Gladioli Live Oak (also known as 'Sword Flower')is a tall spike shaped flowers with multiple flower buds running up the stems. 120cm tall & wholesaled in 20 stem wraps. Gladioli is a genus of the Iridaceae family and are cultivated from corms. 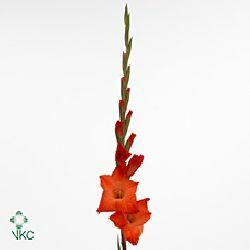 The word ‘gladioli’ is derived from the Latin word ‘gladius’ – meaning ‘sword’. This is because the shape of the gladiolus is similar to that of a sword.